I've had to edit the categories slightly as there seems to have been a typo in the original ;-) and I'm not going to go on about the brewery I work at as that would be wrong, wonderful though our beers are. Best UK Cask Beer: Westerham Audit Ale. I'd been after it for some time and it was very good. Least Bad UK Keg Beer: Sam Smith's Extra Stout. Best UK Bottled Beer: Young's Special London Ale. Least Bad UK Canned Beer: Don't think I've drunk any canned beer this year. 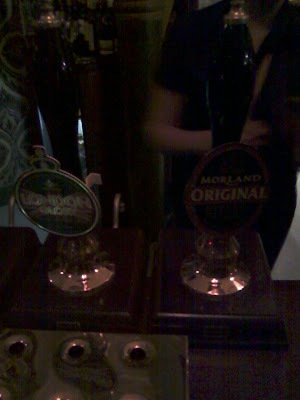 Best Overseas Draught Beer: Haven't drunk any of those either. Best Overseas Bottled Beer: Orval. Thanks to Stewart Howe's blog I now know it's best drunk fresh, and without the unpleasant pong Orval is even better than it is with the pong. Best Overall Beer: Westerham Audit Ale. 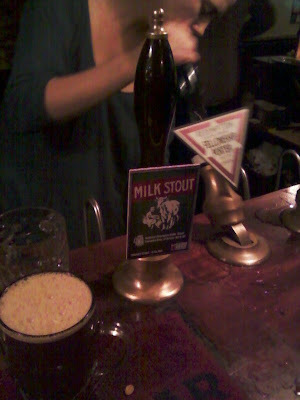 Best Pumpclip or Label: Black Sheep Imperial Russian Stout. Best UK Brewery: Dark Star. Consistently good throughout the year. Pub/Bar of the Year: The Crown. Beer Festival of the Year: Woking. Supermarket of the Year: Booths. Independent Retailer of the Year: Liquid Pleasure. 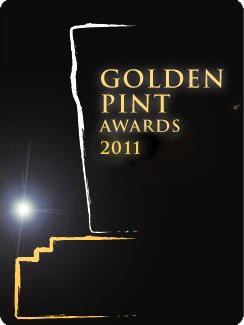 Online Retailer of the Year: Don't think I've bought any beer online this year. 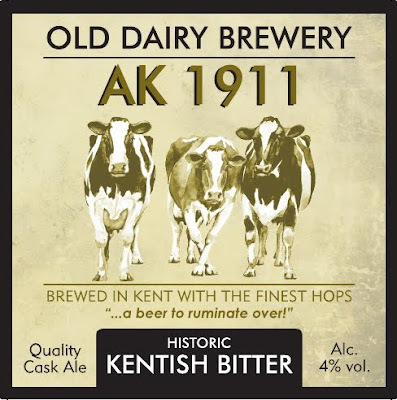 Best Beer Book or Magazine: Kentish brewers and the brewers of Kent. I'm in it! Best Beer Blog or Website: Shut Up About Barclay Perkins. A raging torrent of beer history, and witty too. Best Beer Twitterer: I still don't really get on with twitter but I bought an album thanks to a tweet from Boak and Bailey so them. Best Online Brewery presence: Fullers. Food and Beer Pairing of the Year: Beer and cheese and onion crisps. In 2012 I’d Most Like To: finish my researches into the origins of Goldings. Open Category: Tim O'Rourke deserves an award for The Great Baltic Adventure and the wonders it's done for Imperial Russian Stout. Back in the Summer I started making plans to brew a beer to an historic recipe featured on Ron Pattinson's blog. Things didn't go entirely to plan but undeterred we persevered and now the beer has been released into the wild. It's a pale beer with a hint of honey-like sweetness balanced by the spicy bitterness of Goldings hops. Ron can now be happy that AK has been revived, and if you want to try it you can even buy it online. ...with a reference this time! As my previous post on hop history was a severely lacking in references I've gone out and bought a hop book. Sadly the choice of hop books is extremely limited but thanks to a recommendation from Jens Eiken I've bought "Hops" by AH Burgess. The book is getting on for 50 years old and the copy I've got sat for decades on the shelves of Imperial College library, including when I was there, being taken out a total of three times before it was withdrawn. The book may be old but it's still got a wealth of information. Early on there's a map of hop growing districts with Farnham highlighted, and the first chapter is on the history of hop growing which is just what I need to tidy up my previous post. The big question of what exactly the prolific varieties grown in the 1900s were is answered. I'd got the wrong end of the stick thinking it was a group of hops, in fact Prolific was the name of a variety introduced in 1852. When I get a moment I'll go back and airbrush out of history my misunderstanding. "During the fifteenth century, beer, i.e. hopped ale, was still considered in England to be a foreign drink. No doubt, as their value became more widely known, small plots of hops were grown for home brewing, but most of the hops used were imported from the Continent. Their cultivation on a commercial scale was not seriously undertaken until the sixteenth century, about 1524, the enclosure of common lands having made the growing of such a crop more feasible. Hop gardens were first established in Kent, and there is a record of hop gardens in Norfolk in 1533." There's also plenty more on the origin of English hop varieties, including how there came to be so many varieties of Goldings despite the fact they're grown from cuttings but I'll be coming back to that later. We were in North London for more research on Saturday. 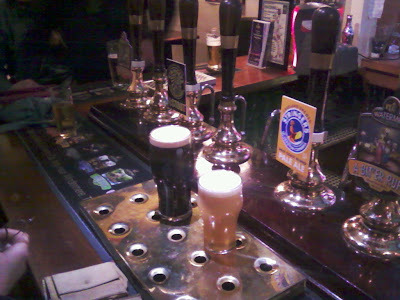 But first we had to go to Covent Garden to check out a gear shop, and whilst we were there it was a good opportunity to have some refreshment at The Harp. Despite the fact this is CAMRA pub of the year we've never been before so I was looking forward to this one. 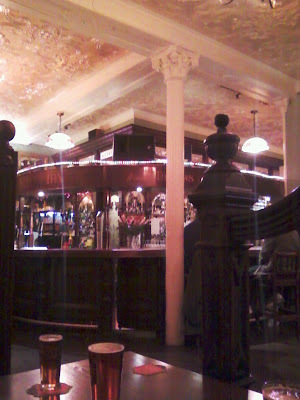 The pub's small and it was packed but eventually we manoeuvred ourselves into seats. 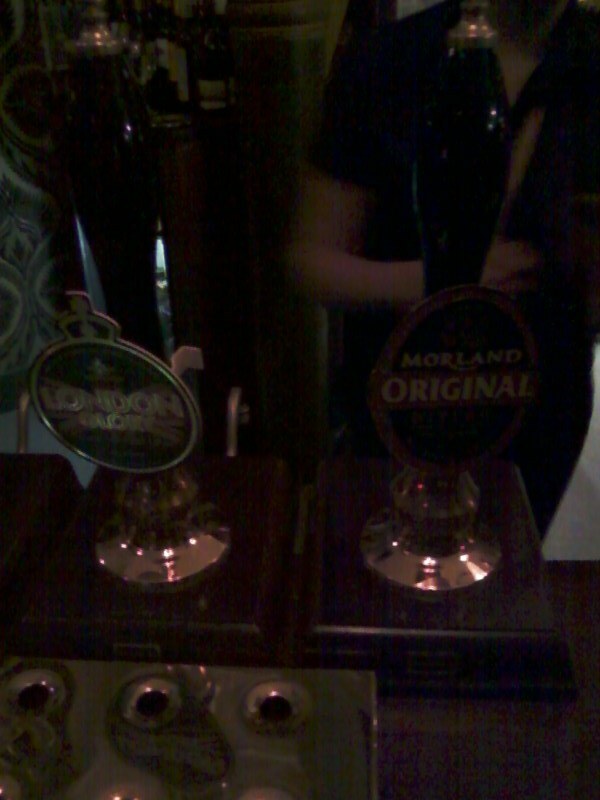 As you would expect there was a good beer range and I started on Draft No. 5 from Marble Brewery. Like everything else I've had from Marble it tasted like concentrated hop juice, which I'm not totally averse to but I soon turned to the dark side with a Dark Star Original. Then it was on to Kentish Town. Normally the lovely Lisa is chief pub crawl researcher but I was involved in planning this one. London Heritage Pubs had to be cross referenced with London Pub Walks and the Good Beer Guide. Then there was the checking on beerintheevening.com and using google map to do searches for places to eat. It was lot more work than I thought so I may have to leave it to Lisa in future. 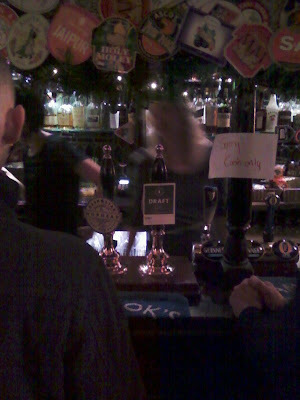 Our first stop was The Southampton Arms, another packed pub with another fine selection of ales. It was definitely dark delights again for us and we had plenty to choose from. 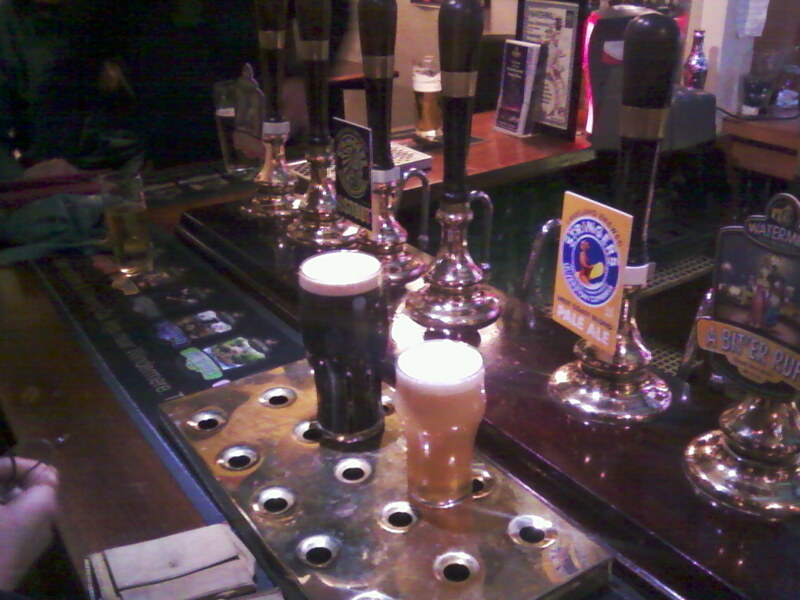 Our favourites were Bristol Beer Factories' Milk Stout and Redemption Fellowship Porter. Next we wandered on to The Bull and Gate. This was a nice looking pub but it was suspiciously empty. The beer had a limited selection and tasted sour so we didn't stay for long. Then we went for some food at The Guanabana, a Caribbean restaurant that the lovely Lisa's careful cross referencing had found. It didn't have a booze licence so Oreo milkshake was the drink choice for those that chose to drink with their food. I didn't bother with such distractions from shoveling food down my throat. The food was great and hopefully we'll be back before too long. After that we wandered on for some more refreshment and stopped at The Assembly House. 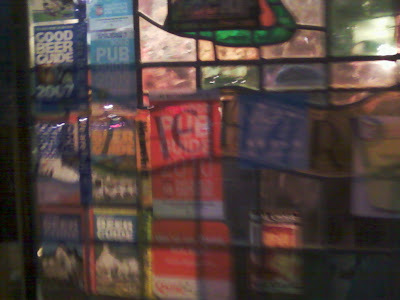 This is a big historic pub that would have been higher on our list had it not been Greene King beers. It was a bit of a barn but I quite liked the pub, and the well kept Old Speckled Hen washed me dinner down well. As it was getting late we headed home after that and didn't even stop for a swifty once we'd got back to Woking. Last weekend I was back in Langdale with a mountaineering club. Despite the horrors of the M25 we managed to make it to the Watermill for last orders, and to my delight Stringers beers were on. As I take my desires for reality because I believe in the reality of my desires I had a pint of No. 2 stout. It was an excellent beer. Our plan for Friday was to go climbing in Borrowdale. After one look out the window in the morning these plans were quickly downgraded to scrambling in Langdale. Then it started raining so the plans were downgraded again to hill walking in Langdale. At this rate it was looking like all we'd be doing was shopping in Ambleside if we didn't get out soon. So we headed up the blue route and wandered towards Pavey Ark and Sergeant Man. 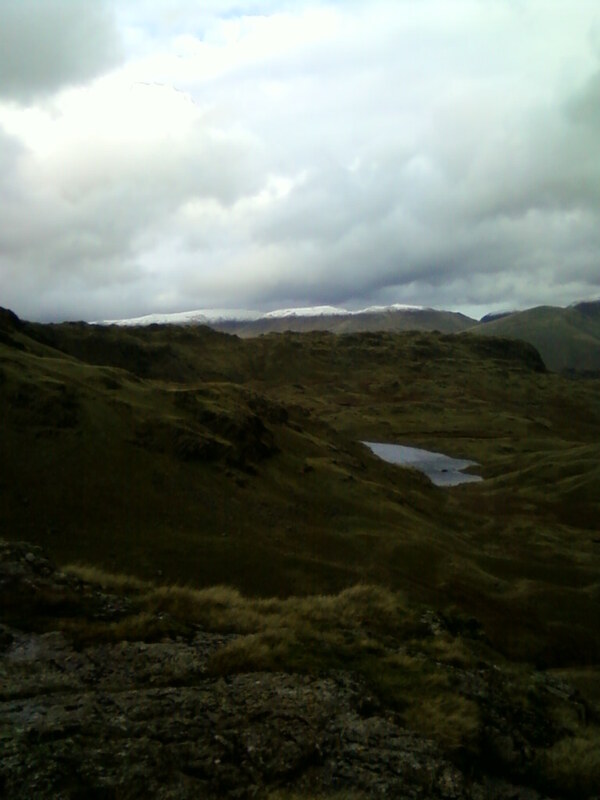 Then we dropped down towards Easedale tarn. By this point daylight was starting to run out and horizontal sleet was being blown into our faces. Defintely time to return. When practicing night navigation I've gone back this way before and if you can't find the path, which is quite tricky once it's dark, it's a right horror. When we were back on the ridge we were too far over for the path and I was starting to despair of finding it. But truding back, with about half an hour of daylight left, we spotted it: a green snake of salvation slithering silently through the bracken to the valley floor. Thing went a bit more smoothly on Saturday. 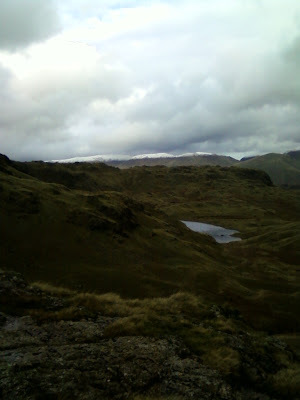 Past red tarn and the three shires stone to wet side edge and then down to little Langdale. We were able to stop for refreshment at the Three Shires Inn. This pub has a scarily large number of signs ordering you not to do things but once you're inside it's very pleasant. Or it was until some wet cyclists turned up and started drying their sweaty socks on the log burner. Perhaps another sign is needed. 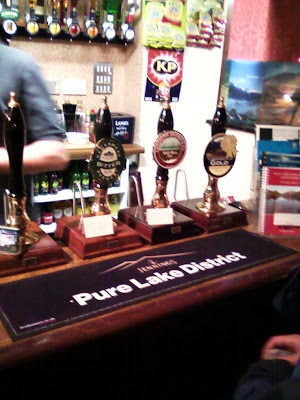 As I'm now an old man I had a pint of Coniston Brewery Old Man ale here. Now it's winter my beer tastes are definitely turning to the dark side. Once it had stopped raining we headed on to the Wainwright's in Chapel Stile. The excellent Cumbrian Legendary Ales Grasmoor was on so we had to stop for a couple. Then it was back to the hut for dinner and refreshments.